This is a campaign I set up for my kids (son Logan 20, son Luke 17, stepson Jayden 14, and daughter Megan 12) My 12 year old just tested at a college reading level, so she is my little brainiac and way more mature for her age than Dad wants, but what a roleplayer! The middle boys enjoy the game once it starts, but you would think I am abusing them the way they act when I force them off Call of Duty to have some family time. lol. Some of you have met Logan at Gencon, and he is an rpg addict, which I take full responsibility for. The campaign is set in Airhde, and begins in the wilds near Hlobane territory. The main story arc centers around Logan's character Garett. From the beginning, we both wanted him to play a character that was cool, that was a bit different, and have it worth a novel if he lives. So he decided to play a paladin...as portrayed by a ranger who was called to service by the gods of the forest. This we did easily using the Class and Half option, with Paladin supported by Ranger. While cool as all heck (imagine a muddy young ranger/forester type but serving Wenafar and nature/forest gods) he has learned the agony of slow leveling as compared to his single class siblings. lol. As an orphaned forester/hunter raised in a muddy backwater village by an old dwarven blacksmith ( a veteran of the Winter Dark Wars who promised Garett's grandfather to look after the family many years ago). We played out Garett's coming to paladin service, which included a vision in the forest, overcome by fog and seeing a stag headed humanoid hunter heralding Wenefar's return and the coming of a great darkness that would not only prevent her from returning, but destroy the world (of course). He awakens and finds an enchanted long sword stuck in the ground by the tree he had slept against, and indicator that it wasn't a simple dream. The blade is a holy blade of Wenefar. I designed it to be like a central NPC in the campaign; one of it's powers is that it levels up, so to speak, with him. It's power is based on his faith (level) and as he increases in faith and perseveres, the weapon becomes more powerful with time. It starts out as a simple +1 sword, but he "unlocks" powers as he levels up. It will later become his Holy Avenger type of weapon, but has a druidic flavor with it's abilites. 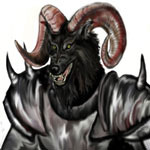 It's bonus to hit and damage increases after so many levels, and powers like Speak with Animals, and other druidic spell-like abilites begin to manifest in him (I had him startled when he heard some animals speaking to him in the forest). Some buddies of mine, old grognards that despise giving players magic items at all, let alone something "unbalancing", thought this sword is over the top. But my argument is 1) its for the story 2) it starts out weak and grows in power with him and 3) it avoids the rpg ritual of the player constantly tossing aside an old magic item for a better cooler one as the game goes on. and 4) I told him that because this sword is a major character in the story, and ultimately very powerful, he will not be finding many items in the campaign. The dwarf fighter Duringarl has been a father figure to him since Garretts folks passed (played by me at times as an NPC or by Jayden). He is in and out of the campaign but a central character in the story. He teaches smithing at the human village, a known master of his craft even back at Grundliche Hohle, but his oath to his dying companion to move to the village and watch over his family lead him away from a life of prosperity and to one of humble living, which he does with an attitude of love and peace (although his dwarven grumpiness attempts to conceal his affection). And Megan plays a pretty 1/2 elf that began play as the local barmaid, running the show for the friendly but morbidly obese innkeeper Otik. She is a rogue and she has been on the run awhile, as the other players find out when their relaxing evening at the tavern is interupted by mercs searching for "a runaway elf slave". The mercs try to take her and a fight breaksout. Of course the mercs are killed and Megs elf girl, Alera, has to confess that she escaped slavery from the wealthy noble Rorigen the Red. And her story is even greater than she or the other players know yet. She was part of a primitive group of elves that had been persecuted throughout the winters dark and hunted until they became nomadic savages, with their former culture all but wiped out. What she doesn't know is she is heir to an ancient elven people, and her blood is needed in a dark ritual by high powers in even darker places. They all scratch their heads throughout the campaign as mercs keep popping up. My son finally turned to my daughter and said "There's more to you than you know. He wouldn't keep sending waves of men searching thousands of square miles to bring back a simple slave." Anyway, lots more to write but I have bored you all enough! I can relay more if you want. My 10 year old daughter played a couple of C&C and Savage Worlds sessions when she was too young to protest. Nowadays, I can get her to play some dice games (Zombie Dice, Shut the box-an old English pub game, and a few others), and she did play Dungeon once. That said, I can't get her to try rpg's again, or many of dad's type of board games. My five year old son is lapping it up for the most part. I think we tried a brief C&C encounter a year ago, and he's keen to play the dice games, as well as board games (including Twilight Creation's Zombies, Dungeon, etc.). I think he's good to go, but I'm hoping she'll return to the fold. It's hard to compete with American Girl, Shopkins?, and all of those girly things.